Everyone remembers what they were doing 17 years ago when they heard the news that the World Trade Center towers had been struck by planes, Mineola Mayor Scott Strauss said at a village memorial service on Tuesday. That is, all except the increasing number of children who were not yet born at the time of the terrorist attack, Strauss said. Members of Girl Scout Troop No. 1447, among those who will only hear of the day from stories, led the crowd in the Pledge of Allegiance. This year marks the last graduating class that was alive at the time of the attacks, Deputy Mayor Paul Pereira said. One day, it will be up to the next generation to tell them, he said. 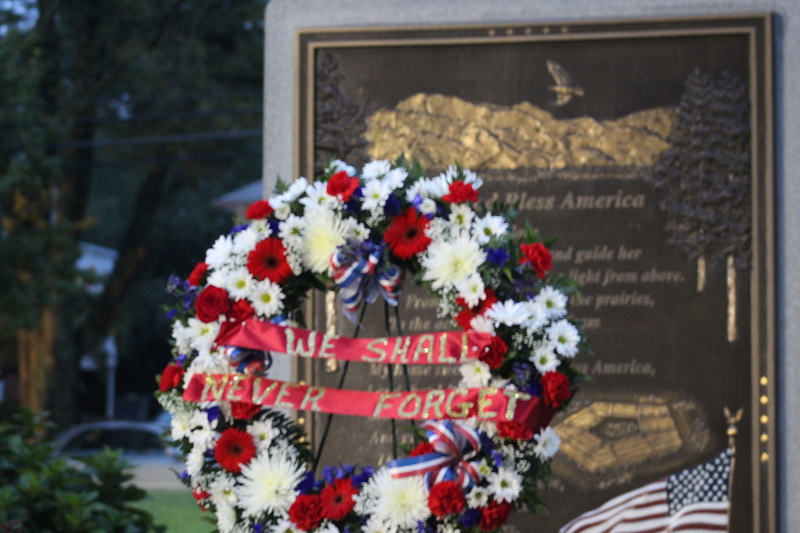 During the ceremony, Mineola Volunteer Ambulance Corps Commissioner Thomas Devaney and President Eileen Lepetit laid a wreath of red, white and blue flowers with “We shall never forget” written across a ribbon upon the village’s Sept. 11 memorial monument. Pastor Chester Easton of the First Presbyterian Church sang the National Anthem. An invocation was given by the Rev. Malcom Burns of Corpus Christi Church, and a closing prayer was delivered by Pastor Wilson Jose of Grace International Assembly of God. Strauss experienced the aftermath of the events first-hand. A detective with the Emergency Service Unit of the New York Police Department at the time, he was part of the team that searched through rubble for survivors. It is estimated that 125,000 people were rescued from the area, making it the largest rescue mission in the world, Strauss said. Though it was not his own story of heroism Strauss retold on Tuesday. It is the story of residents across the nation who rallied around families of those missing and first responders, he said. “Here in Mineola and around the country, people did what Americans do best – you channeled your energy into positive forces. You were going to be part of this rescue effort in any way you could,” Strauss said. He thanked residents who started drives for clothing and supplies. He thanked children who wrote cards expressing their support. Although the country was experiencing a tragedy, it was “a time when we all understood the meaning of our flag,” Strauss said. The country had not experienced the patriotism that “rose from the ashes, piercing the smoke and dust of the ruins,” in 60 years, Strauss said. “We all were united in our determination to get through those dark days and make us as a community and nation stronger than we were. And it worked,” Strauss said. Seventeen years later, everyone must remember the sacrifices that were made, Strauss said. Especially the sacrifices of those who survived only to fight off illnesses developed from responding after the attacks, he added. The way to remember, is to share these stories, he said.